We offer discounts the longer you stay ranging from 10%–20% when you book 3 or more nights. 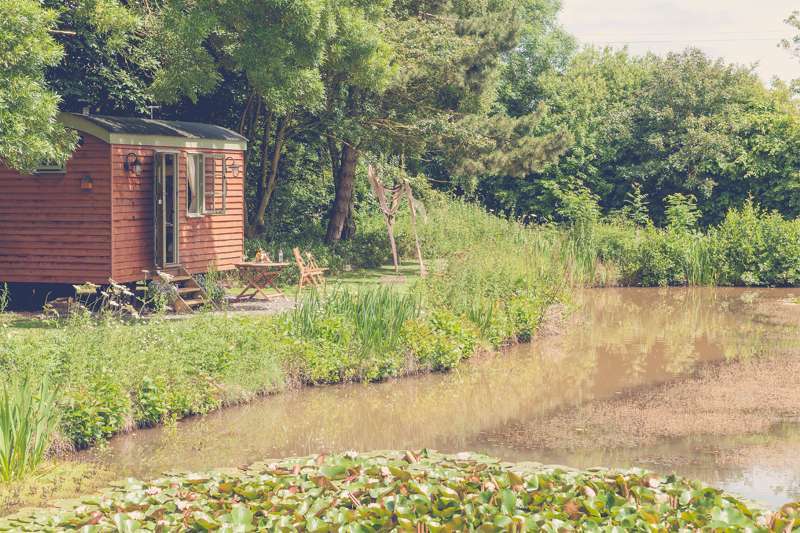 Nestled in the idyllic and unspoilt East Yorkshire countryside our bespoke Shepherd Hut offers memorable and unique accommodation in East Yorkshire. The hut is located half a mile away from our own family run brewery, there you will find our onsite shop stocking perfectly crafted ales and also discover how the Little Otchan Hut gained its name. The chances for wildlife and bird spotting are plenty: Kestrels, Greater Spotted Woodpeckers, Skylarks, Roe Deer, Hares, Buzzards and of course Hedgehogs are all a common sight near the hut. In the summer month’s swallows and house martins use the pond as a drinking destination plus they use mud from the banks of the pond to help make their nests. Dragonfly, Damselfly, Peacock, Red Admiral, Painted ladies, Meadow Browns butterflies are all seen feeding on the Oxide Daisies and Red Campions that surround the pond. This truly creates an idyllic and beautiful away from it all atmosphere. For latest availability and best prices for Little Otchan Shepherd Hut, please use the Date Search above. Inside the hut there is hot & cold running mains water; mains electric; flushing loo, shower, hand basin and heated towel rail; seating and dining table; induction hob, refrigerator, kettle, toaster, crockery, cutlery and utensils; wood-burning stove; telescope; fire pit cooking kit; DAB Radio; TV/DVD player; books, maps and games; hammock; fairy lights. Towels and all bedding and linen is provided. Outside is you very own fire pit for cooking and log fired hot tub so you can relax and unwind. You'll also be provided with two bottles of complimentary beer from our very own brewery along with Yorkshire Tea, coffee and sugar. Fishing is permitted in the pond. The Little Otchan Hut is in the middle of Yorkshire's nature triangle, which includes the unique nature reserve of Spurn Point out on the very edge of the coast where the River Humber meets the sea. It's a mere 5 minute drive to the nearest beach – the dead straight sands along Withernsea, Waxholme and beyond while, inland, the 2017 'capital city of culture', Hull, has plenty to offer. Highlights include the excellent aquarium (01482 381000), the Maritime Museum (01482 300300) and the city's walking tours. If the farm brewery has got you in the mood, then the ale trail is a particular highlight. Two excellent local butchers nearby – East Riding Country Pork (01964 671137) or Melbourne Butchers (01964 670241) – both offer a range of local meats, breads and deserts, while the nearest pub is 2 miles away (5 minute drive or a 40 minute walk The Roos Arms 01964 670353). The Nancy Inn (01964 671117) is 3 miles away and The Boatshed in Withernsea is well worth a visit if you like real ale and cider. All these pubs stock beer from Little Otchan's very own brewery (01946 612201), which operates on the farm. Withernsea is the nearest town where there's a large supermarket and fish mongers which is well worth a visit (Winghams Fish; 01964 614239) – there's a fish and chip shop (01964 612322) by the village's central roundabout. For more diverse options however, drive the half hour to Hull, which offers an huge array of restaurants offering cuisine from all corners of the globe. From Hull take the A1033 towards Winestead from there follow the signs to Halsham once on the B1362 turn right .The shepherds hut is situated ½ a mile along the B1362 at Hall Farm. When turn down into Hall Farm the sign for the hut car park is on the right hand side just before the farm house. Beyond the car park it is a short walk to the hut. A single shepherd's hut sleeping up to 3 adults.